At the end of life, there is death. Only, sometimes, the dead just won't go away. These are the ghosts. Now, some of these ghosts have learned to take on mortal guise again, for short periods of time. They walk the earth once more, pretending to be human. They even have jobs. But why go back to being a baker or a carpenter? These ghosts crave adventure, excitement, intrigue - some place where their special "skills" will be appreciated. And they've found the perfect career. Welcome to espionage. 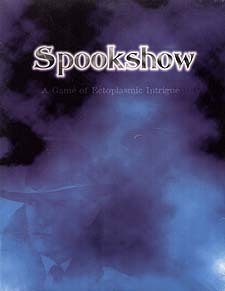 The exciting new game from Clockworks, Spookshow merges the world of espionage with the mystique of the supernatural. The manual contains everything you need to play, except for a pencil, some scratch paper, and four dice. So put on your shades, show your credentials at the door, and welcome to the Spookshow, where the dead spy on the living - and get paid or it.